Nature, in and around us plays with colors and on the canvas, in the form of this world, she creates so many colorful designs and patterns. We see so many shades of the same color, so many patterns, and an astonishing blend of designs in trees, birds, animals, landscapes, sea, and sky. And the most amazing thing is none of them are same, all unique in their creation. Of course, no one can beat the nature but that is what is been tried by Rahul Swami from Madhya Pradesh, India. 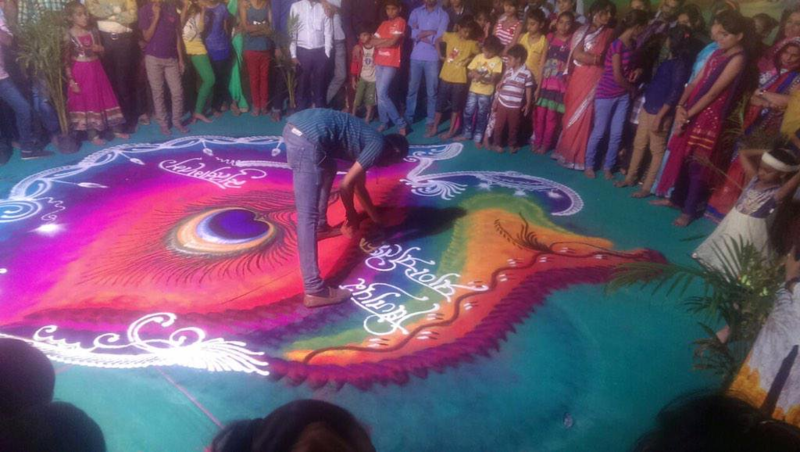 He is a Rangoli Artist who plays effortlessly with colors and brings them alive within few minutes. Rangoli is an art form and is done normally on the floor of the house, room or courtyard using materials like a flower, dry flour, and colored sand or colored rice. Usually, Rangoli is done on festivals to beautify the surroundings and it also has a Spiritual significance. There are different ways Rangoli can be made using dry and wet colors but there is always one thing common in them – Colors. Where ever they are made they bring along with them the joy of colors, patterns, and happiness. Rahul hails from Goi, Sendhwa MP and has been playing with colors since the age of 17 years. He is a brilliant Rangoli artist and brings alive the colors by his patterns and unique designs. The way he jumbles them and that also with such an ease it seems anyone can do it. The vibrancy in his decoration seems like he is ornamenting with designs. 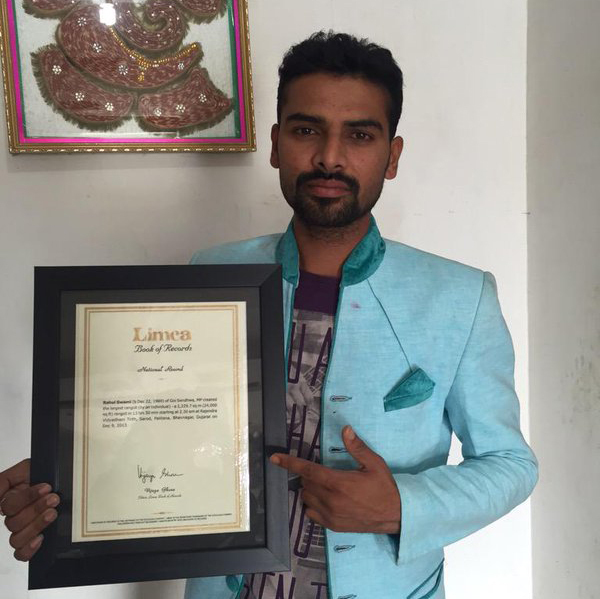 Rahul holds the Limca Book of Records for being the fastest Rangoli maker in India. 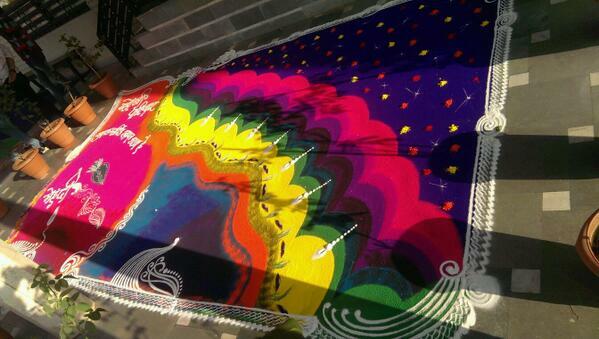 He can make Rangoli of 10 square feet in just ten minutes using thirteen kgs of color. 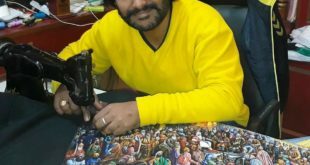 That is not all he has till now created more than 10,000 Rangoli patterns and none of them are same. It is his brilliant talent and the richness of his imagination that Rahul is called to temples, institutions, and on the television also to showcases his flair. 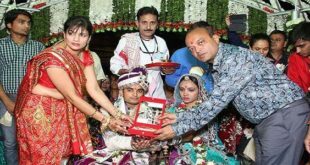 Rahul Swami also holds the record of creating a Rangoli on an area of 24,000 square feet, which is equal to 4.5 basketball courts in just thirteen and a half hours. He is been appreciated by famous television personalities for his amazing aptitude. Rahul uses the technique which is called free hand “Galicha Rangoli”. He usually starts the pattern by keeping a central point and keeps on building the design around it. Once he is done with the framework he then starts the intricate use of color to decorate the pattern. Sometimes he even tries to convey a social message from this platform of his. He draws portraits of famous personalities also, from colored sand. He also blends flowers with sand colors to make patterns more vivacious. With this breathtaking talent of his, this is for sure that, one day he will definitely hold the Guinness Book of World records for making Rangoli on a space of 2,50,000 square feet and make us proud.